I recently purchased a Nikon D700 camera to ultimately replace my Olympus E-3. I loved my E-3, but there were certain features that were lacking and Olympus seems more interested in developing their micro 4/3rds cameras than releasing newer pro level cameras so it seemed time to make a switch. I received the D700 yesterday and managed to find a little time to take a few shots with it. I still have a lot to learn about how I want to configure the camera and how to best make use of it, but I think I’ve got the basics. This shot was taken in Bandemeer Park in Ann Arbor, Michigan. It was late in the day with the sun about to set. 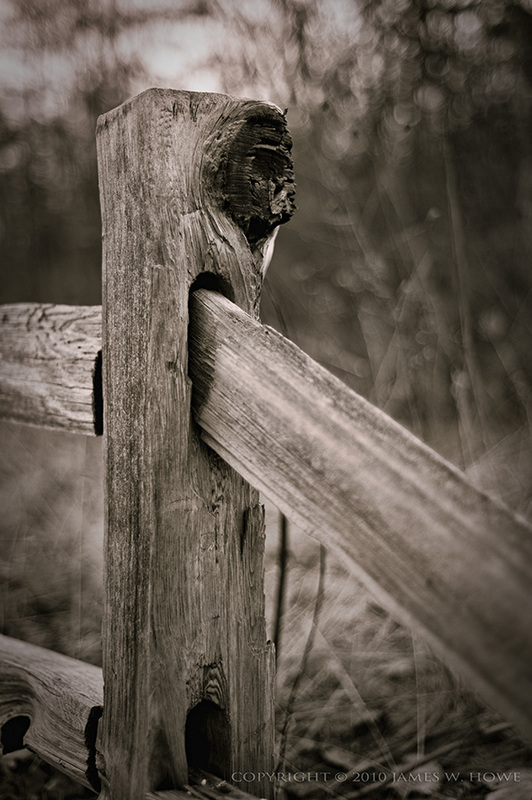 I saw this fence post and decided it might make for a nice shot. The color of the post blended well with the background. In a few weeks the background will be green, but for now it is a nice winter brown. Overall I like the way the picture came out, although if I were doing it again I might go for slightly more DOF. I think I would like more of the post itself to be sharp, not just a portion of it. The image was converted to black & white using Adobe Lightroom and then I added a bit of local contrast using Topaz Adjust in Photoshop CS4. Other thoughts? Please leave a comment!